How to Relax is part of The Mindfulness Essentials series of how-to titles by Zen Master Thich Nhat Hanh, introducing beginners and reminding seasoned practitioners of the essentials of mindfulness practice. Pocket-sized, with original two color illustrations by Jason DeAntonis, How to Relax shows how critical it is to regularly interrupt the hub-bub and routine of our lives to stop, relax mindfully, and recharge. 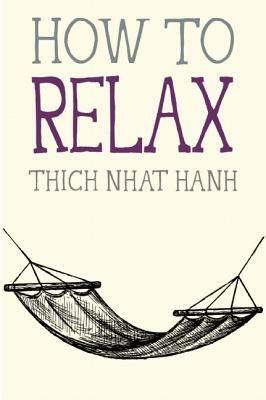 Thich Nhat Hanh says that when we relax, we "become calm water, and we will reflect reality as it is. If we’re not calm, the image we reflect will be distorted. When the image is distorted by our minds, it’s not the reality, and it causes lots of suffering." Relaxation is essential for accessing the tranquility and joy that lead to increased personal well-being. With sections on healing, relief from nonstop thinking, transforming unpleasant sounds, solitude, being peace, and more, How to Relax includes meditations you can do to help you achieve the benefits of relaxation no matter where you are. Scientific studies indicate that meditation contributes tremendously to well-being, general health, and longevity. How to Relax is a unique gift for those who want a simple guide to achieving deep relaxation, controlling stress, and renewing mental freshness and clarity, appropriate for those practicing in any spiritual tradition, whether seasoned practitioners or new to meditations. With fifteen two color drawings by celebrated artist Jason DeAntonis. Thich Nhat Hanh is one of the most revered Zen teachers in the world today. His best-selling books include Be Free Where You Are and Peace of Mind. He lives in Plum Village in southwest France. Nhat Hanh has been teaching the art of mindful living for more than 70 years. Jason DeAntonis is an award-winning Bay Area artist, known for his sumi ink illustrations, and his fine carpentry and custom furniture. He has also worked in sculpture, costume design, glass blowing, painting, printmaking, and book illustration. His work has appeared in Mindfulness in the Garden, How to Sit, How to Eat, How to Walk, How to Love, and How to Relax. He lives in Berkeley, California. as well as the NPR Bestseller list, the San Francisco Chronicle Bestseller list, the Boston Globe Bestseller list, the LA Times Bestseller List and the extended New York Times Bestseller List. They’ve been featured in Brain Pickings and the Utne Reader.com among many other websites.